(Nanowerk News) Researchers at Eindhoven University of Technology (TU/e) have developed a very tiny wireless temperature sensor that is powered in a very special way: from the radio waves that are part of the sensor's wireless network. This means that the sensor needs not even a single wire, nor a battery that would have to be replaced. The arrival of such sensors is an important development on route towards smart buildings, for instance. But the applications are many and various. The smart buildings of the future will be full of sensors that will respond to the residents' every need, and will be as sustainable as possible. Like heating and lighting that only switches on when someone is in the room. That's only possible if these sensors are wireless and need no batteries, otherwise in a large building you would have to change the batteries every day. This is demonstrated by TU/e researcher Hao Gao who will be awarded his PhD on Monday 7 December for his thesis in which he developed a sensor that measures just 2 square millimeters and weights a mere 1.6 milligrams, equivalent to a grain of sand. 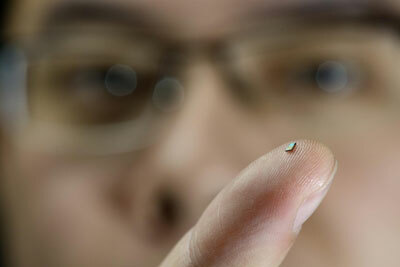 The tiny temperature sensor is on the finger tip of Ph.D.-student Hao Gao of Eindhoven University of Technology. The current version of the sensor has a range of 2.5 centimeters; the researchers expect to extend this to a meter within a year, and ultimately to 5 meters. The sensor has a specially developed router, with an antenna that sends radio waves to the sensors to power them. Since this energy transfer is accurately targeted at the sensor, the router consumes very little electricity. And the sensors themselves are made such that their energy consumption is extremely low. The sensor also operates beneath a layer of paint, plaster or concrete. As Peter Baltus, TU/e professor of wireless technology, explains, this makes the sensor easy to incorporate in buildings, for instance by 'painting' it onto the wall with the latex. The same technology enables other wireless sensors to be made, for example to measure movement, light and humidity. The application areas are enormous, Baltus says, ranging from payment systems and wireless identification to smart buildings and industrial production systems. They won't be expensive either: mass production will keep the cost of a sensor down to around 20 cents. The sensor is based on 65-nm CMOS technology. The project, called PREMISS, has received funding from the STW technology foundation. The title of Hao Gao's thesis is 'Fully Integrated Ultra-Low Power mm-Wave Wireless Sensor Design Methods'. The integrated circuits research was done in the Mixed-Signal Microelectronics group and also involved the TU/e groups Electromagnetics and Signal Processing Systems as well as the Center of Wireless Technology.